This post continues my series on possible futures for the Church. Here I argue that we need to break down barriers. Church culture today loves its barriers. It loves to emphasise what makes Christianity different from other faith traditions, or what makes one’s own denomination different from others, or one’s own church different from the one across the road. We need to break them down. Not because they are meaningless. For those who think all religious beliefs are irrelevant to everything else, it is easy to think there is no point in any of them. For those of us expect our religious commitments to make a difference, they matter a great deal. However church culture turns them into barriers. It does two things. First, it treats disagreement as a problem which hinders communication. It doesn’t need to. Disagreement is normal and healthy. Secondly, it clings onto inherited barriers that no longer reflect real differences of opinion. This was debated for centuries. What it meant to call Jesus ‘of one Being with the Father’ was the subject of high political intrigue. Bishops were exiled and recalled from exile on the basis of which theory was dominant at the time. proceeds from the Father and the Son. 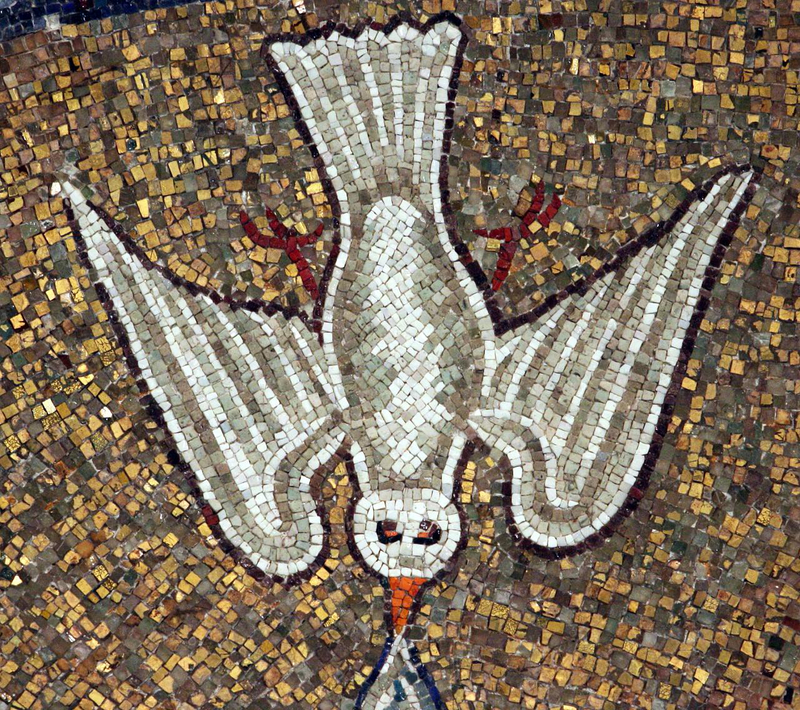 Holy Spirit, mosaic from Ravenna Baptistery, from Art in the Christian Tradition, a project of the Vanderbilt Divinity Library, Nashville, TN, USA. A thousand years ago this innovation caused wars. The earlier version had the Spirit proceed from the Father alone. Today, only a handful of scholars have the slightest interest in who the Spirit proceeds from. So why keep reciting these statements? Thus the Creed, far from expressing what Christians really believe, has become part of our doctrinal and ritual furniture, something we have to make space for while we get on with the more meaningful things. Many churches have adapted by composing alternative ‘creeds’ with no formal authorisation. This reverses the logic. The bishops who established the wording of the Nicene Creed followed the normal sequence. Faced with questions, they used the resources they had to find the most convincing answers. When they found them, they expressed them in a statement. This sequence makes sense. First we debate the question. When we establish answers we express them in belief commitments. If the belief commitments are important enough we summarise them in statements. If they are exceptionally important we keep repeating the statements. When churches use alternative creeds, the process works in the opposite direction. We feel we ought to have something looking like a creed, because that’s what church services do. (Or maybe the person planning the service senses that they wouldn’t get away with not having one at all.) The content of the alternative creed then has to be some compromise between what they feel they ought to affirm and what their priorities really are. It is as though the form is what matters, while the content only needs to sound roughly appropriate to the occasion. So churches cling to statements of belief which no longer express what people really care about. Why not just get rid of them and break down all those unnecessary barriers? I am not talking about whether they are true. Lots of things are true which we don’t recite. But people who are not used to church services, and turn up to one, may find they are expected to stand up and publicly assent to statements to which they have never given any thought. Reciting things makes them seem important. This sets up unnecessary barriers against those who aren’t already committed to them. So we have turned the logic of our barriers on its head. Instead of starting with commitments, some of which are so contentious that they create barriers, we are so used to a barrier-ridden organisation that we feel obliged to uphold commitments which would not otherwise interest us. We have come to define our different churches in terms of doctrines that, in all honesty, we don’t care about. This bizarre situation was explored by George Lindbeck’s influential book The Nature of Doctrine. Instead, why not define our churches by the things we really do care about? This, after all, is what we do in every other field of discourse. I wonder whether the reason, at least in part, is the mismatch between our spiritual awareness and the way we interpret it. People who research religious experience, like the Alister Hardy Religious Experience Research Centre, observe what happens. People of every and no religious background may have a distinct experience of transcendent spiritual reality. How they interpret it depends on the ideas in their background and their local culture. Roman Catholics think they saw the Virgin Mary, Hindus think they saw Krishna. Add to these the many others who have not had a distinct one-off religious experience but do have a relatively consistent inner sense of relating to the divine. These groups of people characteristically like to share in a local group that enables them to express their spirituality. For many, the obvious place to find it is their local church. This church may provide what they are looking for. In addition, it may also offer a load of irrelevant or unconvincing doctrines. These can often be tolerated or even assented to, if the real reasons for supporting the church are those deeper spiritual ones. In this sense churches and their doctrines are parasites on real spirituality; but perhaps we knew that all along. The irrelevant and unconvincing doctrines survive because church leaders mistakenly imagine their congregations believe them. Back to alternative creeds. At their best they can express positive beliefs without setting up unnecessary barriers. Here is an excellent example I came across while on holiday in Lostwithiel, Cornwall. It was written by the vicar, Paul Beynon, and I have his permission to reproduce it here. ruler of light and darkness alike. who revives the weary and heals the wounded. and leads us into truth and life. The god Jesus believed in is a god who created the whole human race. To follow Jesus is to believe in a god like that. Like any loving parent, God wants the family to get on well with each other, and avoid putting up barriers to exclude each other. This entry was posted in Churches, Theology and tagged belief, churches, creeds, disagreement, dogma, Nicene Creed, spirituality. Bookmark the permalink. The idea that people are asked in Creeds to assent to things they don’t think about or aren’t important to them makes the assumption that what we should assent to are things which we naturally or inherently believe. These things should not be foreign to us, therefore they should not make any demands of us nor stretch our capacity to think or change. The should come from within and not from without. By this logic, we should abandon all liturgy, all belief systems (especially historic ones) and most scripture. Perhaps abandoning God would be the best thing. Then whatever we wish to put in God’s place would best express our own belief system or lack of same. I’m not sure what your position is. This leaves me feeling you think people should jolly well believe what they are told to believe. I guess there’s more to your position, but I don’t know what. This is an intriguing proposal but I have a few questions. 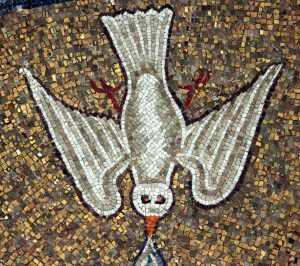 First, if one were to pursue the project of writing a fresh creed (or creeds), what place would catholicity have in its writing and use? Does acknowledging the faith of a place necessarily disavow the potentially differing faith in another place? What happens when churches write creeds that contradict each other? Second, for those of us who do use the creeds in our preaching, what is to replace them as signifiers that the authority of what we say comes from the Church and not from ourselves? To put it another way, part of my understanding of the value of the creeds is that they act as a check against the abuse of clergy power. One cannot simply arbitrarily invent doctrines since the creeds, which are used liturgically by the entire people of God, bound and define the essentials of what may be taught. The people are provided with a rubric which tells them whether their minister is to be listened to or not. Third, I wonder if Richard Grand doesn’t have a point. Part of the role creeds have played is to define faith, to expand it (for some), and to limit it (for others). The inclusion and exclusion experienced by those attempting to be faithful to God’s revelation in Christ is a natural consequence of having a bounded faith, a faith that, it seems to me, is exactly the type witnessed to throughout the scriptures. In the New Testament, no less than in the Old, some people are ‘in’ and others are ‘out’. Does the Christian faith cease to be what it has always been if the boundary-marking action of the creeds is removed? Thanks for this thoughtful response and challenging questions. On writing new creeds. Yes, my preference is not to include them in acts of worship at all. This is partly because it excludes: most people aren’t sure what they really believe and don’t like being put on the spot. (In my experience, the only people who do feel sure what they believe are the ones who know least.) It is also partly because any set of words will over time become irrelevant or misleading. Authority and abuse of clergy power. I agree that this is an important point, but I think we’ve got the problem anyway. The present status of the creeds doesn’t provide effective constraints. What effectively constrains the average preacher? The congregation’s expectations, I guess. I see this as two problems: what constraints should there be on what gets aired, and what freedom should be given to clergy? What constraints should there be? When I preach I try to be careful not to tell my congregation what to believe. I give information, explain the issues and sometimes suggest questions for them to ponder. Of course the information is always challengeable. For example, some scholars believe Jesus never existed. But to the best of my ability I follow the scholarly consensus. This is different from following the Creed because the scholarly consensus draws on all currently available information and is always being updated. The difference is like the difference between going to an ordinary doctor and going to a doctor who ignores all the medical research later than Galen. This is why I don’t think congregations should be ‘provided with a rubric which tells them whether their minister is to be listened to or not’, unless the rubric – like the doctor’s exam passes – is constantly updated. Churches should be open to the possibility of new insights. Otherwise they are dead. Abuse of clergy power. I think this is a question of professional competence. In other professions the paid professional is given more freedom of decision-making as they gain more experience and knowledge. Admittedly this often gets reduced to a box-ticking exercise – we are a very box-ticking society – but the Creed doesn’t work any better as a criterion. In an earlier post I argued for separating the teaching ministry from running the parish. We really shouldn’t be expecting people who are full time running about doing practical things to give at least 52 talks a year. People who give talks need plenty of time to read books, if the talks are to be worth hearing. On your final paragraph. (You really have pressed a number of important buttons!) Every society, to function at all, has a bounded faith. Some things are acceptable, others are not. However, the bounds are fuzzy. This is how they allow for change. Christians today don’t have the same faith that we had 100 years ago, let alone 1000 years ago. I gave my own description of this in a post last year. I would add that, in every age, there are some who want clear definitions of who is in and who is out, and there are others who want to welcome everybody. We need to become better at disagreeing with each other without rejecting each other.